The developer who once proposed a mosque and Muslim community center near ground zero now plans a museum devoted to Islam at the same site. Sharif El-Gamal said in a statement he wants to build a three-story museum "dedicated to exploring the faith of Islam and its arts and culture." He said he commissioned French architect Jean Nouvel to design a 5,000-square-foot museum. The building also would include a sanctuary for prayer services and community programs. It's unclear how El-Gamal would fund the project. Spokesman Hank Sheinkopf would only say that El-Gamal would initially finance it himself and hoped to find other benefactors. Buildings at 45 Park Place and 51 Park Place, two blocks from the World Trade Center site, would need to be demolished first. A 5-foot-long chunk of airplane debris that is believed to be a piece of landing gear from one of the planes that hit the twin towers was found in an alley behind 51 Park Place a year ago. 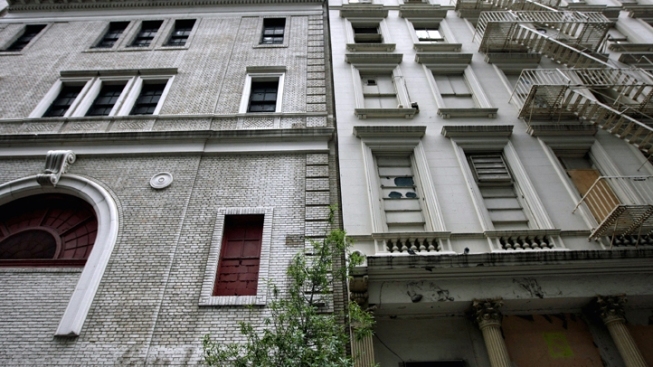 The NYPD said at the time the landing gear was found after surveyors hired by the property owner inspecting the rear of 51 Park Place called police on Wednesday. When plans for the Islamic center at 51 Park Place were made public in 2010, opponents said they didn't want a mosque so close to where Islamic extremists attacked. They argued the site was "sacred" because landing gear from one of the hijacked Boeing 767 jets had punctured the roof of the building on Sept. 11. The five-story building, which was once a Burlington Coat factory, now includes a Muslim prayer space that has been open for three years. El-Gamal's statement says daily Islamic prayer services would temporarily move while construction was under way, and then would resume at the museum when it is completed.